On the 23rd and 24th October 2009 in São Paulo (Brazil) the Centro Universitário Belas Artes de São Paulo hosts the second edition of BOOMSPDESIGN – Architecture, Design and Art Forum. It is a great opportunity for our students to meet fantastic professionals from Brazil and all over the world, “says the advisor of Belas Artes, Patricia Cardim. “The support of Belas Artes Ubiversity has been fantastic to our project. This year we also started partnerships with the community creating a new atmosphere within design studios around the city, stores, restaurants and galleries, promoting new insights into the world of design. The Brazilian community will have the opportunity to exchange ideas with great speakers, understand their thoughts and learn more about their projects”, says the promoter of Boomspdesign, Roberto Cocenza. A new way of looking at the contemporary world that has radically transformed the aesthetics of products and the nature of consumer culture. A MINI DESIGN FILM FESTIVAL in the main lounge, exhibitions and other activities around town. Rua José Antonio Coelho, 879 – unidade 3 – São Paulo (SP). The first edition of BOOM SP DESIGN –International Architecture, Design and Art Forum will bring booming speakers to Brazil and promote a cool atmosphere to the city. Organized by RSPROMO it will be held simultaneously to the opening of Karim Rashid’s Exhibition at Instituto Tomie Ohtake – October 24th 2008 to January 04th 2009. KARIM RASHID’S Exhibition in a partnership with KARIM RASHID’S – NYC office and Instituto Tomie Ohtake – São Paulo. RSPROMO is organizing both projects. Solo organization of BOOM SP DESIGN with great support from its sponsors and partners. Curated by Albrecht Bangert, German, specialist in arts and design exhibitions and books also director of Studio Bangert. Special participation of Angelo Derenze Jr., publisher of Casa Claudia Luxo-Editora Abril. 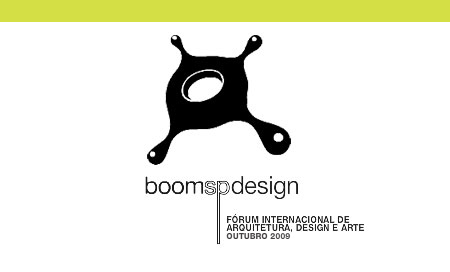 BOOM SP DESIGN – Architecture, Design and Art Forum will be hosted at Shopping Iguatemi – Avenida Brigadeiro Faria Lima, 2232, 9th floor, São Paulo – SP – Brazil, on October 23rd and 24th, 2008, from 9am to 7 pm.